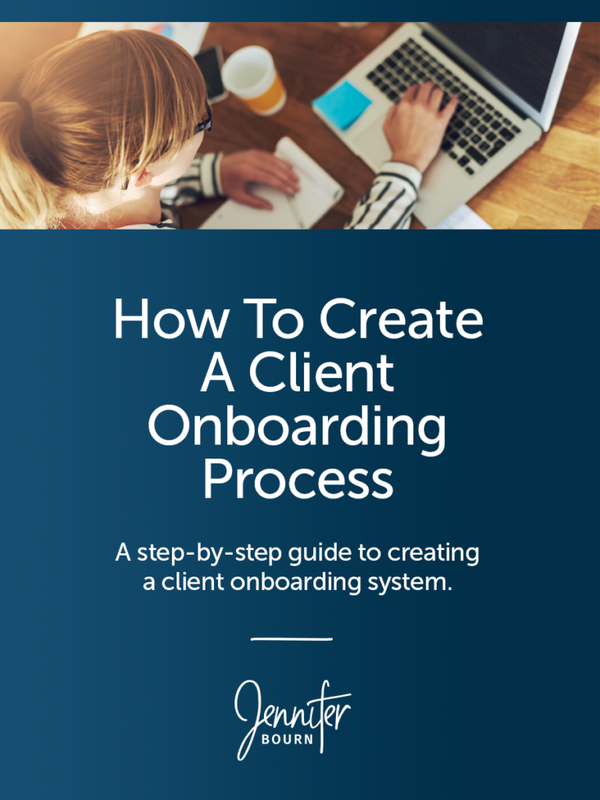 Get a step-by-step guide to creating a new client onboarding system that can be automated to free up your time and better serve your clients. Client onboarding is the process of welcoming new clients to your business and their project and getting them up to speed so you can work together effectively, get the information you need, and build a strong relationship. The goal of a successful client onboarding system is to reduce ambiguity and increase clarity so it is easier for clients to provide what you need and for you to serve them with confidence. What are you communicating to your clients? What is working great right now? Where are you or your clients getting stuck or hitting a hurdle? What tasks are you repeating for every project you take on? What type of experience are clients having now and how/where can you improve it? In what order should the content be provided so it is as easy as possible for the client to understand. Ideally, each new piece of content should build upon what was communicated in the previous piece. How many steps does there need to be in your onboarding process? Will you drip the content out in a series of emails, provide a single project handbook or welcome packet, or give clients the content in a membership site? What educational materials will you create and provide? Will they be ebooks, checklists, video trainings, collections of articles, or worksheets? The fourth step is to implement a system for your new client onboarding process. Document exactly what is going to happen, step-by-step and either automate it or delegate it. This will allow you to free up your time for the meaningful work with your clients that matters most. Once your new client onboarding system is implemented and ready to go, you need to test it. I cannot stress how important testing this system is. The first exposure your clients have to your work will be through your onboarding process and how it makes them feel will set the tone for the entire project and glaring typos or design mistakes leave a less than stellar impression. When I initially created the client onboarding processes for my agency Bourn Creative, I had six colleagues with varying levels of technical savvy go through the process as if they were a new client. They each read and evaluated every piece of content, looking for typos, confusing phrases, unknown words, and generally anything they didn’t understand. The goal was to make sure my communication was clear, easy to understand, and firm, fair, and friendly. With their feedback in hand, I edited the content as needed, refined the process a bit further, and began using it with clients right away. At first, I let clients know about my brand new onboarding system and asked them to provide feedback along the way — good or bad. Simply asking for feedback shows clients you care about their thoughts and feedback and demonstrates your commitment to quality and constantly improving your level of service. Do clients still have basic questions or are confused in any area? Is one piece or part of the project tripping them up? If so, what could you create or provide to help them? Is there a section that can be improved? Have you learned something new or received some great insights into how you could improve part of your process? Are there any places that could be streamlined or simplified? If you identify small changes or fixes that need to be made, handle them immediately. Also, as your business grows the type of clients you work with and the type of projects you take will shift, and your onboarding process will need to be updated to reflect that. You also may need to update the content to reflect any changes in technology or tools used. Creating a documented, automated onboarding system for new clients can sound unfriendly and cold. In a technology-dominated world where relationships and personal connections are more important and valuable than ever, talking about automating client onboarding with software may seem counter-intuitive. But I challenge you to shift your mindset. Automating the onboarding process isn’t meant to replace or eliminate personal interactions with your clients but supplement and enhance them. By automating the process, you will save valuable time normally spent on low-level administrative tasks that can now be refocused toward working directly with your clients on the most meaningful and strategic work. For example: If you use flat-rate contracts, you’re trading a specific scope of work for a specific dollar amount. Included in that flat fee is a set number of hours for project management and consulting. If a client has a lot of questions, needs a lot of hand-holding, and requires a very hands-on project management approach, they will drain the project management hours and force you to make a tough decision: reduce the hours allotted to design and development or eat the hours and lower your hourly rate. By automating the administrative and educations tasks associated with onboarding new clients, you can reduce the number of hours spent on administrative tasks and emailing back and forth with clients, which gives you either more hours to put toward design and development, or a higher profit margin. Having a clear, documented, automated process in place also demonstrates to the client that you are a true professional, that their project is in good hands, and that you take your business, their project, and your work very seriously. By automating the process, you’re guaranteeing your clients that nothing will be forgotten and nothing will slip through the cracks. It won’t matter if you’re sick, traveling to a conference, on vacation, or busy with another client, the client will be served automatically without interruptions or delays. The idea is that every client you work with has a consistent, extraordinary experience and they can feel confident referring you to their friends and colleagues because they know you have a system in place to care for them. My onboarding process was the catalyst for every other system in my design agency today. In fact, it was so successful that it inspired me to create documented, step-by-step processes for every part of my business from branding to website design. For our custom website design and development projects, I added to the onboarding system, additional individual automated processes for design, development, website launch, and post-launch follow up. Altogether, I call the system my Profitable Project Plan and when I implemented it in my business, it reduced my project management hours on projects by 50%! It was mind-blowing. By adding Profitable Project Plan to my business, I went from being frazzled, overwhelmed, and exhausted to finally having the freedom I had always wanted. Before I added systems to my business, I took very little vacation and now I an able to take around 8 weeks of vacation every year — and one new client onboarding process started it all. If you’ve been thinking of creating an onboarding process for your business, now is the time to stop thinking about it and do it. You’ll be amazed at the difference it will make in your business. If you’re interested in skipping all the hard work and want a complete done-for-you system, I invite you to check out Profitable Project Plan. It’s the only business training program for designers and developers that walks you through the management of an entire website project step-by-step — from initial sales call to post website launch follow up — and includes everything pre-written and ready for you to customize.